Want a quicker, more natural way to remove unwanted body hair? 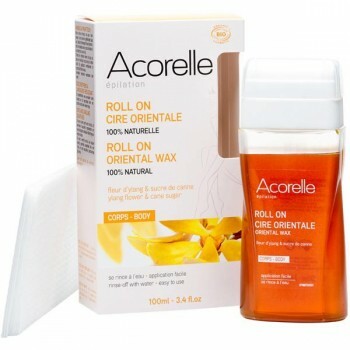 Try Acorelle oriental roll-on wax. Thanks to its targeted applicator, this beautiful sugar wax inspired roll-on makes precision to body or facial hair fast and easy while being kind to skin. Sugaring wax stems from a homemade beauty process used since ancient times in parts of the Middle East and north Africa. It remains popular today as a faster and less painful method of hair removal. Combining the exotic scent and moisturising properties of ylang-ylang, cane sugar and glycerine with calming and soothing water flower and chamomile, this organic waxing kit is a treat for the senses. Ylang-ylang is a tropical flower popular in perfumes and aromatherapy for its uplifting fragrance. But alongside sugar cane, this exotic flower has also been used for centuries thanks to its anti-inflammatory properties, making it ideal for waxing products. Containing 10 reusable waxing strips, this easy to apply kit is the perfect choice for simple waxing anywhere, anytime. For best results, use with ant egg cream from Gutto Natural to gradually minimise hair regrowth.